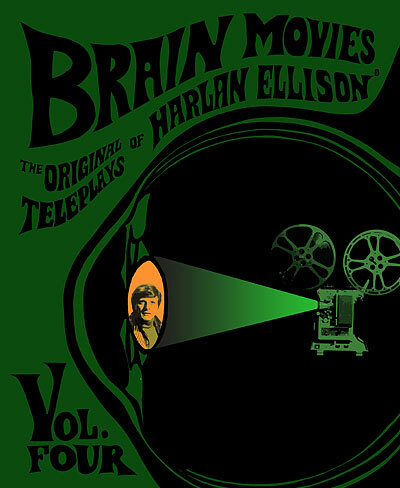 Brain Movies enters uncharted territory with two new volumes featuring unproduced series pilots created by Harlan Ellison®. Read what might have been in the 1970s and 1980s if Ellison’s ideas made it from the typewritten page to the small screen. READ THE BASIS FOR ELLISON’S FIRST GROUNDBREAKING PLAGIARISM SUIT: Brillo, the two-hour ABC pilot based on Ellison and Ben Bova’s short story of the same name, was the impetus for the author’s first plagiarism lawsuit. At long last, Ellison afficionados can now see how the story of a (then-futuristic) 1990s beat cop teamed with the latest in law enforcement technology (the eponymous robot) would have played out on the small screen had not the network passed on the series. For fans of the absurd, some of the “suggestions” issued by ABC Broadcast Standards and Practices are recounted in the editor’s note. …as well as the treatment for “Funny Money,” a further adventure for Brillo and his human partner, Mike Polchik, plotted by Ellison and Bova when the ABC series was still in development. LEARN WHAT WAS REQUIRED TO LURE GLORIA SWANSON TO THE SMALL SCREEN: “Who Killed Purity Mather?” is the second of Ellison’s four scripts for Burke’s Law. The author considers the production of this teleplay to be a high point of his television career and the accompanying editor’s note recounts how he lured the elusive Gloria Swanson down from Sunset Boulevard to appear in her first television role. VENTURE WITH ELLISON INTO THE UNIVERSAL PICTURES BLACK TOWER WHERE, HARLAN ASSURES YOU, “EVERY FLOOR IS THE THIRTEENTH.”: “Jeffrey’s Being Quiet” was Ellison’s contribution to the short-lived parapsychology series The Sixth Sense, where he spent a few hellish months (recounted in the editor’s note) as a story editor in the early 1970s. Inspired by the same personal incident that produced the short story “All the Birds Come Home to Roost,” as well as a key plot point in “On the Downhill Side,” this treatment is Ellison at his best—harnessing his pain in the service of his art. Cover art by Jason Davis & Bo Nash based on the cover of DANGEROUS VISIONS by Leo & Diane Dillon. The scripts in this book were reproduced from Harlan Ellison’s file copies. The pages originated on a manual typewriter, hence the idiosyncrasies that set them apart from the sanitized, word-processed pages of today.